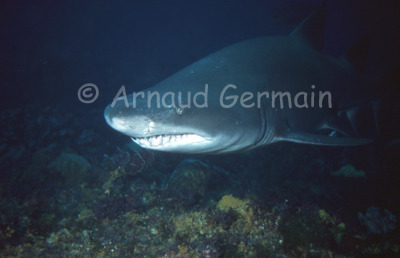 During the mating season, the Ragged Tooth Sharks are everywhere on Protea Banks, off the coast of South Africa. As I like to get close and personal with my subjects and the Raggies (as they are known) let you come quite close, I waited in a gully, in the path of an oncoming shark and took the picture when I was camera to nose with him. When he saw me, he just turned away.